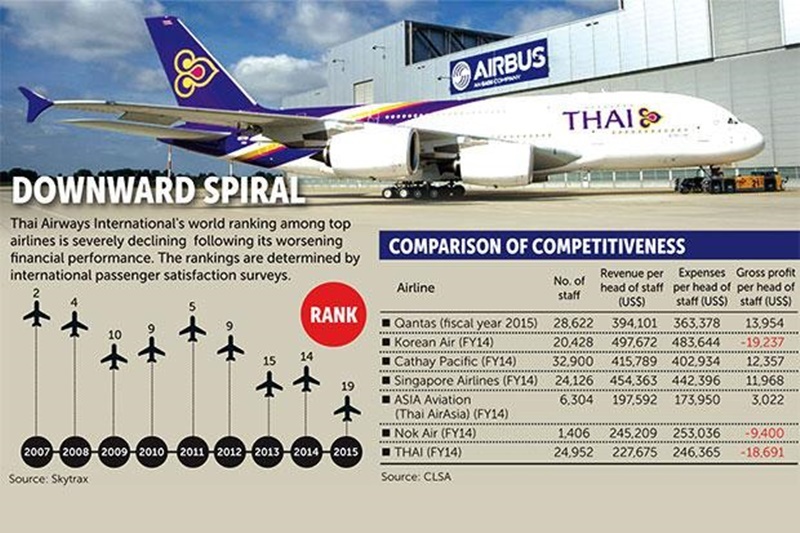 BANGKOK: When Charamporn Jotikasthira, a veteran banker and engineer, assumed the presidency of Thai Airways International (THAI) last December, he vowed the struggling national carrier would “undergo an urgent transformation” to become profitable by 2016. Analysis: Losses balloon to B18.1bn as strong staff union, executive perks hinder cost-cutting strategies. “Currently we are caught in a critical storm. Every staff member must join hands to pull up this plane,” the 58-year-old executive said soon after he took up the reins of the airline. But after his first year in office, his efforts to restructure the 55-year-old state enterprise have drawn flak on various fronts ranging from the head of government to airline staff. Prime Minister Prayut Chan-o-cha has criticised the poor financial performance of the carrier, which is heading for a record net loss this year, as well as high salaries and excessive perks for top management staff. Transport Minister Arkhom Termpittayapaisith has questioned Mr Charamporn’s “costly” recruitment of an international consultancy firm and a foreign aviation expert as his personal adviser to help restructure the airline. Obstructed by bureaucratic hurdles and staff resistance to big changes, Mr Charamporn’s declaration to make the 25,000-staff airliner a profitable organisation by 2016 looks bleak. Although Mr Charamporn, president of the Stock Exchange of Thailand for four years, from 2010-2014, is likely to survive his first-year performance evaluation, he will only have another six months to prove himself or face the axe, one cabinet minister said. It is not uncommon for a THAI president, also known by the company’s internal coding as “DD”, to be unable to complete his contract, as past governments – both civilian and military – struggled for direct control over the once-lucrative state enterprise. Flight routes and plane purchases were often made based on political decisions rather than their commercial feasibility. The workforce is relatively large with a strong union and excessive perks for senior executives and directors have drawn much criticism. The Royal Thai Air Force has supported THAI since its founding in 1960. More than half of the airline’s 17 DDs and about 50 per cent of its chairmen on the board have been men in blue uniforms. Thaweesak Koranantakul, a member of the State-Owned Enterprises Policy Committee known as the “super board”, said the airline’s rehabilitation measures had not improved its bottom line. The national carrier is not yet in the clear despite the management’s efforts to reverse the dire situation, he said. The plan to improve finances and reduce losses involves suspending unprofitable flight routes, adjusting marketing strategies, selling assets and unused aircraft and restructuring manpower – including a massive early retirement programme and improving non-core businesses. The company plans to send 1,400 staff into early retirement this year as a part of its long-term plan to cut 5,000 workers. THAI is also cutting flights on unprofitable routes by 5% from last month until March. Though the target is to slash B8-9 billion in costs this year, a recent review showed the airline’s operations in the third quarter fell short of targets – especially for cost reduction, Mr Thaweesak said. THAI posted a net loss of B9.89 billion in the third quarter, compared with a net profit of B1.1 billion during the same period last year. Of the July-September period net loss, B4.23 billion stemmed from aviation business operations while exchange rate fluctuations and damages to the company’s assets and aircraft incurred a B4.63-billion loss. The net loss over the first nine months has ballooned to B18.1 billion, almost double that of the same period last year, raising the likelihood the flag-carrier’s losses this year could equal or exceed the all-time high of B21.3 billion hit during the political crisis in 2008. The airline reported a net profit of B6.23 billion in 2012 and net losses of B12.05 billion in 2013 and B15.61 billion in 2014. The cabinet has ordered Mr Charamporn, who is also a former executive at Siam Commercial Bank, to submit a restructuring plan by the end of this month, saying the current employee management is “inefficient”, the president told Bangkok-based foreign journalists on Nov 4. At a board meeting on Nov 11, Mr Charamporn said the reform plan was on track and the airline would start making profits in January. He also insisted his restructuring plan has started to yield positive results, as the the carrier’s operating loss from July to September this year was 27.3% less than operational losses last year, at B2.79 billion. The first batch of 428 staff left the company in July, the airline said this month. Though THAI has cut salaries for its top eight executives by 10% during months that the company suffers losses, top officials at the Transport Ministry say it is not enough and is still a point of concern that Mr Charamporn has failed to rein in. One of the most contentious of the president’s decisions, according to critics, was to pay B10.6 million to hire international adviser Wayne Pearce, a former CEO of Oman Air, for six months. Mr Charamporn also paid out B35 million to global consultancy firm Bain & Co to develop a restructuring plan for the airline, upsetting cabinet ministers. “In principle, when we hire a top executive to run an organisation, it means we are confident he is competent to lead. It is not right if he hires a consultant to help,” said Mr Arkhom. Mr Charamporn has defended his decision to shell out millions for international help, saying it was necessary to help THAI to compete on the international stage. Using a football analogy, he said THAI is competing against top global teams like Manchester Utd or Real Madrid, so it needs an internationally renowned manager to help. “A consultant is like a coach to train and elevate THAI to a level where it can compete on the global stage,” he said. A group of more than 10 retired senior THAI executives had offered in September to advise THAI for six months for a token fee of B10.6t, an ironic gesture mimicking the B10.6 million the airline is paying to Mr Pearce. “We feel it is our duty to return something to the organisation where we spent much of our lifetime working,” said Jothin Pamon-montri, who retired from THAI after 35 years in 1996, when he was executive vice-president for quality and safety assurance. Capt Jothin pointed out the airline’s problems must be fixed from the top. THAI union president Dumrong Waiyakanee said the airline’s board deserved the blame for three consecutive quarters of losses, not just the president and other management members since the board had approved the restructuring plan. The lack of teamwork, unity and common goals hinder the THAI president’s mission to turn its balance sheet around, other THAI staff said. Seen as as being a tough and sometimes unpleasant leader, Mr Charamporn faces unspoken resistance especially from senior executives, making it difficult for him to achieve his goals. Many staff are complacent and are not ready for changes spearheaded by Mr Charamporn, and they feel demoralised in the workplace, according to THAI staff. Nevertheless, Mr Charamporn, who declined to be interviewed for this report, has vowed to cut 20% of the airline’s non-fuel charges by the end of 2016. Speaking at the Foreign Correspondents’ Club of Thailand on Nov 4, Mr Charamporn said cuts would be made to expenses such as maintenance, aircraft, salary and on-board service costs, which amounted to B180 billion in 2014. The measure is part of a package of 21 measures devised by THAI to thwart financial losses. “If we can reduce those costs, we will easily make a profit,” he said, adding the carrier has reduced its aircraft from 135 to 94, and the different types of aircraft operated have been cut from 11 to eight, which will lower maintenance costs – a major contributor to losses. Eventually, the carrier will have only four or five models, he added. The national flag carrier will also suspend its flights to destinations such as Los Angeles, Madrid and Johannesburg, he said. “But this will take time to do,” he warned, saying THAI is acting as fast as it can to do away with expendable costs this year to move forward with its financial rehabilitation plan in 2016. Investment analysts remain sceptical of the carrier’s prospects of revival. Bualuang Securities projects the airline will lose B20 billion this year, B3.38 billion in 2016 and B1.59 billion in 2017. Earlier this month, Bualuang also downgraded its stock recommendation for THAI from “hold” to “sell”. In a client note on Nov 12 it predicted the share price would fall to B7.5 over the next 12 months. The share price closed on Friday (Nov 20) at B9.5. In the year to date, the stock has plunged 34.93%, while Thai AirAsia – or Asia Aviation Plc – has risen 11.16%. “We won’t see positive results from the business restructuring plan in the short term. There are also risks it won’t go ahead as scheduled because of the company’s rigid cost structure and the multitude of stakeholders involved,” the brokerage said in the client note. CLSA Securities (Thailand) Ltd also gives a “sell” recommendation for THAI, with a B9 one-year target price. “It is a difficult task for Mr Charamporn to turn around the airlines in a sustainable manner as you have to either increase revenue or cut staff. But THAI continues to lose market share and has to pay staff salaries for 3.5 years just to get rid of them,” CLSA Thailand head Prinn Panitchpakdi said.